Posters, newspapers, photographs and other resources have been digitised and uploaded to iBase so that anyone from around the world can browse the history of San Diego State University. SDSU Library and Information Access department supports the information, curricular and research needs of the university's diverse community through the widest possible range of resources. One these resources is the Digital Collections website, developed in conjunction with iBase. The library continually digitises photographs, newspapers, posters and other resources, importing them into their iBase management system and richly cataloguing them. 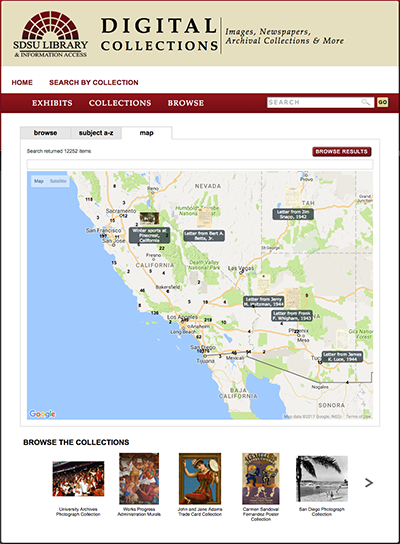 Collections include historical photographs of San Diego State University and the San Diego region, materials documenting the history of SDSU and other historical or topical media projects, all of which are arranged in collections and published to the library's publicly-accessible website. iBase customised the standard look and feel of the site to match the library's requirements, the result blends in seamlessly with their other resources, whilst retaining the ease of use which iBase have become famous for. Images are watermarked automatically during the upload stage, but the untouched and un-watermarked original images can be downloaded by logged-in system managers only. Digital files have been placed into collections which helps new visitors easily discover content as they may be unsure which terms to search for. A wide range or curatorial data including fully geotagged longitude and latitude metadata is available, but the public has been granted only a limited view of it. All document files such as a PDFs can be easily viewed page by page using the web browser and without installing third party viewing software. The website homepage includes a section for system managers to add their own current digital projects news entries. iBase offers SDSU Library and Information Access great value for our investment. We were able to customize both the metadata and interface to an unprecedented degree when compared to other software vendors. In addition, the digital asset management system handles high traffic loads and performs solidly. Best of all, the customer support is unparalleled, even though we are separated by many time zones. The iBase team is efficient, knowledgeable and friendly.